Krista at Krista Quilts for hosting her version of Throwback Thursday. For some finished quilts there is a back story -- er, I mean a story about the back. Such is the case with "Shoofly on Steroids" that I reviewed last week. Again, I was a new quilter, watching every daily rerun of Simply Quilts, absorbing every new idea thrown my way. (Oh wait, as a new quilter every idea was new!) Somewhere I heard or read the suggestion to use up excess fabric on the back. In the end I replaced it with a single fabric because I was too embarrassed to put such a mess on the back of my "masterpiece." I had even gone to the effort of basting the quilt before I realized that actually quilting the sandwich was WAY beyond my abilities at that point (still is!) -- plus it needed to be done by Christmas -- so I unbasted and went to Plan B. Not wanting to waste such large cuts of fabric, I folded it up and buried it on the shelf where it still resides. I suppose in today's environment it would be considered a very modern top! What goes around, comes around. Linking up with Krista for Throwback Thursday. Less than two week till Peg Bingham's Fall Quilt Camp in Ripley, WV! Before I go full-steam into class preparations, I need to clear some things off my sewing table. To justify, these projects are ones I plan to show in the Teacher Spotlight as potential future classes. This first project I am calling "Trip to Melbourne" because a gifted pack of 10-inch squares of Benartex Melbourne was the starting point. I added fabrics from my stash to make this a large twin. 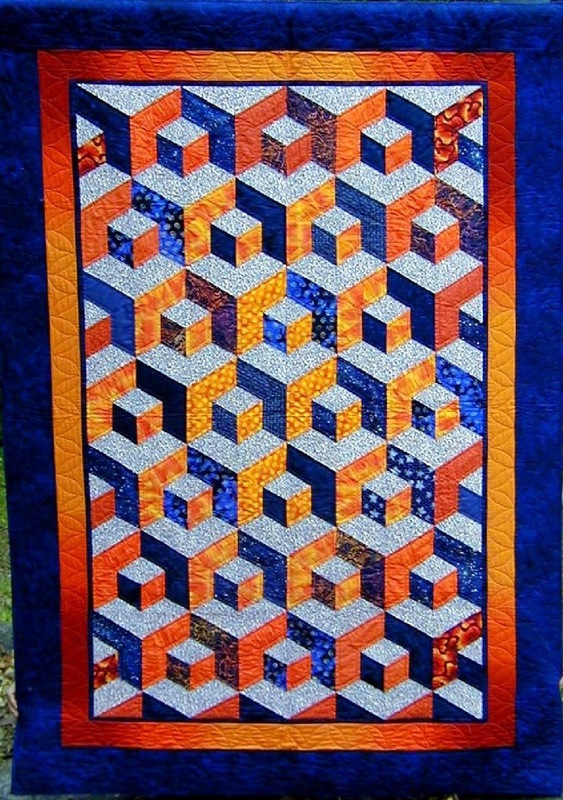 The pattern is "Spare Change" from the book Loose Change by Kansas Troubles Quilters. All the patterns are very easy, using precut squares. This second project I'm calling "Gray Side of the Moon" because I seem to be in my "gray phase" of fabric love. 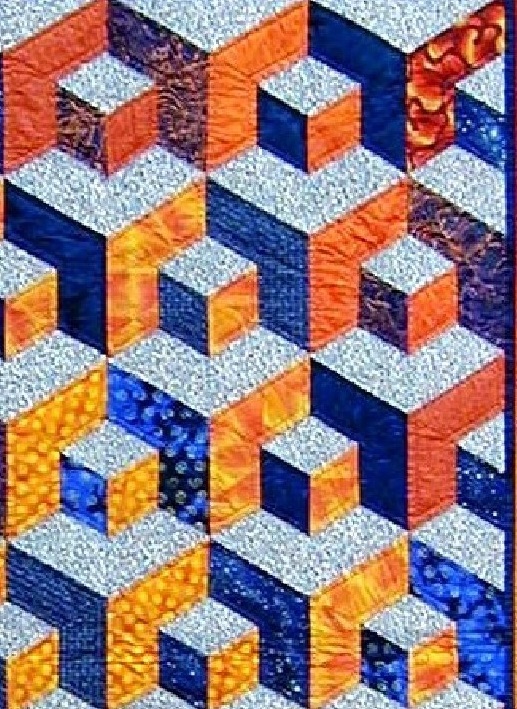 The pattern is "Top-Notch Diamonds" from the October 2015 edition of American Patchwork & Quilting. (Sorry, the lighter gray diamonds blend into the flannel-back tablecloth design wall.) I've been using strips I had previously cut for a failed project. The pattern calls for trimming the diamonds to square up the quilt but I can't bear to waste that much effort. Instead, I plan to add half-diamonds on the sides and plain setting triangles top and bottom which may involve a fabric purchase... oh, well. I'm also counting down to the end of the year, hoping to balance my stash enhancement with outgoing projects. Nothing added this week and nothing to count out. So that's what's on my design wall this Monday morning. 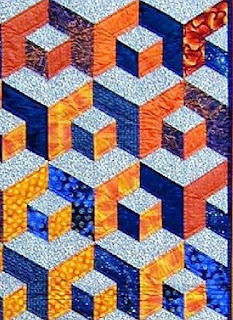 Head over to Patchwork Times to see what the rest of the quilting world is working on. Since I showed Son-2's quilt last week, it's only fair to afford equal time to Son-1 and his wife. 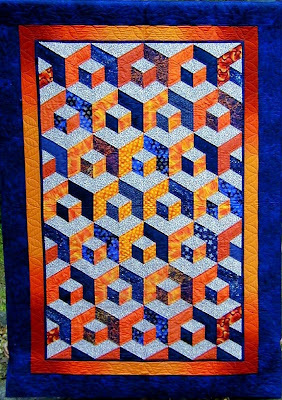 This is possibly the second quilt I ever finished -- the first being a Quilt-in-a-Day Double Pinwheel for GS-3 in 2001. These sampler blocks were part of a shop's Second Saturday Sampler program. The deal was to buy one Thimbleberries kit for $5 and if you returned with the completed block the next month and watched a new product demo, the next kit was free. These blocks cost me $60! Not a matter of false advertising; I either didn't get a block finished in time or forgot to go pick up the next one on time. Lesson learned. I had just joined a guild and one of the ladies suggested I try hand piecing so I practiced on these blocks -- which partly explains why I was always late in finishing. But when it came time to setting them I went back to the sewing machine. For some reason I did not want to do a traditional setting with sashings or plain setting blocks. So why not complicate things with an original design? I think I saw an episode about shadow quilts on Simply Quilts and decided to try it. The blocks were supposed to finish at 10" but because I hadn't quite conquered an accurate 1/4" seam, I added the frames to make them finish at 12". The frames also help set them off against the background. The quilt is about 70" square. Before I had EQ, I designed the entire thing on graph paper. (I wish I had saved that!) When I realized that the light sections of the big shoofly would be very big and uninteresting if they were plain, I decided to put subliminal shooflies in the background. Looking back on these early quilts I realize that I was a lot freer in my design choices then, not unlike the modern quilters today. I am working to regain some of that spontaneity. ... Is this the Chattanooga ChooChoo? No, not really, but I was in Chattanooga for the AQS Show on Friday and I did pass through the Tennessee Aquarium Plaza on my way to a delightful dinner with friends at Puckett's Restaurant Thursday night. Puckett's got it's start as a trendy grocery and deli in Franklin, TN, then branched out to the Leiper's Fork art and antique colony before adding a downtown Nashville and now Chattanooga location. The show was very nice -- on the small side and in a single location, which made it very maneuverable compared to the Paducah show. This was the first time I recall seeing a contest category for "Modern" quilts (though there may have been one in Paducah, I couldn't work my way through the crowds) and it was fun seeing them all together. Some I still don't "get." The ones that impressed me the most were basically traditional with "modern" quilting. A brief stop at The Quilting Squares on Saturday added another 1.25 yds. A destashing bundle to the Music City Modern Quilt Guild (6.75 yds) and a couple of gifts (1.5 yds) counterbalanced my purchases. My design wall this morning is bare ... I can't even get to it for all the mess that has accumulated with my in-and-out lifestyle the last two weeks. But soon I will be able to show you a new French Braid sample for my upcoming class at Fall Quilt Camp. To see what others are working on in the quilting world, hop over to Patchwork Times. Many of my readers also follow The Colorful Fabriholic so I'm pleased to announce that Jan Ochterbeck's long-awaited book finally hit the shelves at the AQS Show in Chattanooga!! I have my copy, and I look forward to trying out some of the patterns. Congratulations, Jan!! Y'all go out and get yours right now! I'm in Chattanooga at the AQS show today, but had to share a couple of comments in connection with yesterday's post about Ode to Orange, an early quilt I gave to Son-2 and DIL. 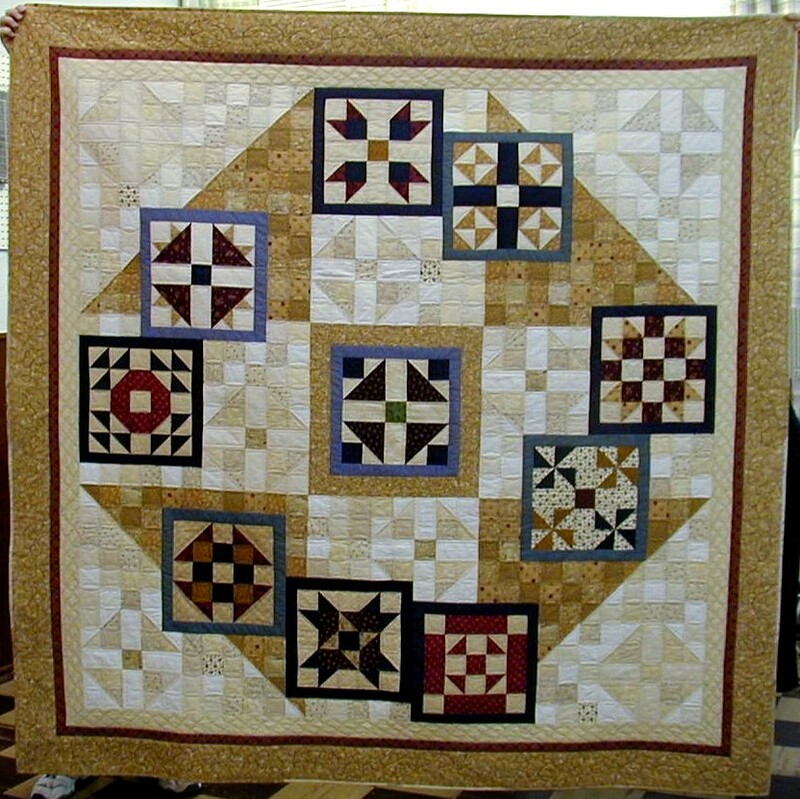 "Love this quilt my mom writes about: http://hillsidequilter12.blogspot.com/2015/09/tbt-ode-to-orange.html … . Gets a lot of use in our home. (Took another L. Smith original to TIFF, too.)" "Having a quilting mother-in-law is THE BEST." I have to add: Having a son and daughter-in-law who appreciate my work is even BESTER! Sadly, a number of my earliest projects are still UFOs. But there is one completed early project I am proud to show. Honeycomb Waffle class with Sara Nephew at the Indiana Heritage Quilt Show in 2003. Not sure exactly why I selected the class OR the colors, but my quilting life changed at that point. The Colors: I thought I hated orange, but having worked on a charity quilt with orange in it, I found my attention drawn to orange when fabric shopping. I had accumulated a collection of orange FQs (the medium). I also had a collection of dark blue FQs, the complement of orange. And I happened to have yardage of the light floral with both orange and blue in it to be the constant. The Plan: Because I had used a variety of fabrics, it took a while to find a pleasant arrangement. I decided to put the lighter oranges in the middle to create a glow. The Gift: I gave it to Son-2 and DIL where it has been used (very well) in their family room ever since. The Prize: Third place ribbon at the Tennessee State Fair in the small/lap quilt category! Well, we need to support the LQSs, don't we? And Indianapolis has such wonderful shops, who could resist? I found my way to Quilts Plus (twice!) and Quilt Quarters, both on the north side of town. I will say that I'm a heckuva lot more conservative these days and except for a few impulse buys I have plans for everything. A couple of half-price pieces will go into Christmas gifts. Some gray and red for a next-Christmas wall hanging. ... hoping it will go well with my other grays and yellows ... still have no idea what I'll do with them. And a FQ bundle of teals and grays, some of the same I already used in Loose Change. When I went back to Quilts Plus yesterday for something I regretted not getting on the first visit (a surprise for a friend), I found the Women of Courage border print I need to replace what I screwed up at retreat -- on the half-price table!! From time-to-time I've mentioned my love of antique quilts, but it's time to admit I'm a card-carrying member of the American Quilt Study Group and I have been at Seminar this week. In fact, I am part of the host organization, Midwest Fabric Study Group. A lot goes into planning and hosting an annual gathering of this magnitude. Since Middle Tennessee is not quite the Midwest, I volunteered for something I could manage from a distance -- the welcome event. We decided to reflect on bygone days when ladies (and some businessmen) would lunch at a department store tea room, a time when hats and gloves were the uniform of the day. Few people even own a hat these days so my job was to coordinate the Feathers and Flowers Bonnet Boutique where attendees could "rent" a hat for the occasion with the proceeds going to the AQSG Endowment fund. I was responsible for the design and layout of the booth only; the hats were contributed by several individuals who were either collectors or antique dealers. A couple of my helpers were instrumental in arranging things to their best advantage. ... or simply adding a chapeau with their jeans. The real fun was watching someone who "never wears a hat" get cajoled by a friend into selecting one to wear. There was hardly a hatless head in the house when the tea got underway. Blame it on The Mama! It took the quilting revival leading up to the Bicentennial for The Mama to jump into quilting. Unfortunately she passed away late in 1979 so her quilting career was short lived. 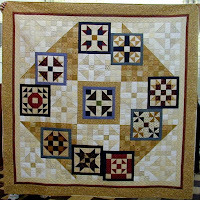 In the intervening years she finished four quilts -- one was a cross-stitched whole-cloth top which she paid to have hand quilted, and the other three were quilt-as-you-go. She was a Georgia Bonesteel, lap quilting/quilt-as-you go kinda gal. That technique appealed to her because she could work on small sections as she and Daddy Bill traveled around the world. And when it was done, it was done. So it's no surprise that the only UFO she left behind was a pieced quilt. ... and some by machine. I suspect the machine blocks are later when she was probably pushing to "getterdone" because the quality of workmanship is not up to her standards. I decided to learn to quilt so I could finish it. But I had two boys to raise and a job to put them (and myself) through college and life just got in the way. It was 20 years before I finally got serious about this dream. Then I discovered it was not nearly as close to finish as I had thought! Whereas the pattern was to be a periodic feature in Quilter's Newsletter Magazine, she only had the issues with the intro and the first two patterns! But it appears she chose to start on a couple of the other blocks first. As you can imagine, the fabrics are mostly polyester and the quality .... well, you can almost see right through it! The fabric is chintzy, the blocks aren't square. Can you understand why it's still unfinished in the box? I WILL do something with it, if only a 4-block wall hanging, as a memorial to the woman who was everyone's BFF. I'll be linking up with Krista Quilts for Throwback Thursday. Very little, if any, sewing was accomplished this week. The cleaning/organizing continues. I emptied 5 project boxes by simply putting the fabric back on the shelf! Several UFOs have been pulled out to offer at the Orphan Adoption Event September 18-20. Cynthia B at Quilting is more fun then housework is coordinating this trade event. Since I will be out of town between now and then, I'm working hard to get nice photos to make my meager offerings more appealing. Check out the guidelines; you might have something you want to "release" or you might "catch" someone elses unfinished masterpiece. Back in my secretarial days, whenever I had to take fake shorthand, my avoidance reflex was to get veeery sleepy. Now I recognize that when I start something totally out of character -- like cleaning out a closet -- I must be avoiding something. Hmmm .... could it be writing a class supply list? In spite of my best intentions to make 8 Top Notch Diamond blocks a day, I missed a few days for out-of-the-house activities and before I knew it I had an itch to clean out my closet. (I wish I had taken a before picture.) The problem was so much (s)crap had accumulated in the studio because I couldn't get into the closet to put stuff away. On the left I got rid of two shoe cubbies that had been intended for FQs but were really just messy space hogs. On the right side I have consolidated class and retreat supplies along with some hand-sewing projects. Since the closet is underneath the basement stairs I had to find something that would fit at the low end. Those drawers contain some "theme" topics; there is space in the top drawer for another theme (or two). The blue storage bag on the left contains all my S'mores quilts made from block swaps and group projects. Now I just need to find a place for all the bags of batting scraps that came out of that back corner .... the mice will be disappointed. Hey, when you live in the woods you expect to share your space with a few critters. However, mouse bait is on this week's shopping list!